Sport-grip temples and comfort features. High impact-resistant lenses with a scratch resistant coating that absorbs up to 99.9% UV. Meets ANSI Z87.1-2010. 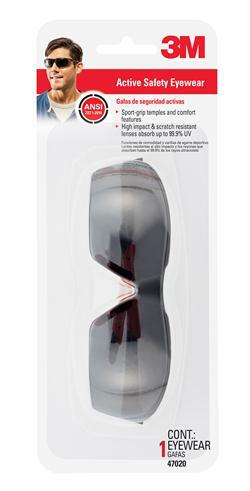 Jaco Aerospace and Industrial is your one stop resource for 3M(TM) Active Safety Eyewear, 47020-WV6, Black/Red Frame, Grey/Scratch Resistant Lens, 6/case and all of your 3M Products, Tapes, aerospace and industrial needs. SKU Marketplace Product Description: Sport-grip temples and comfort features. High impact-resistant lenses with a scratch resistant coating that absorbs up to 99.9% UV. Meets ANSI Z87.1-2010.